2 days, 3 rivers, 3 cream teas, 1 swim, 1 van, £42 on Chinese takeaway. Here's the story. The phone calls started on Thursday afternoon; Bunny had a van he was itching to use, Dave had sacked off his ship and Phil was as keen as ever to "work" (I.e. go paddling). Bristol was decided as the meeting place before getting off to Bala van-style. By the time the tardy twosome made it to Bristol, we decided to bunk down for the night and make an early start the next day (thanks Lucy!). At 6am on Friday morning we loaded Pete's van with Dave's bike as a shuttle and set off. Armed with nothing more than the Welsh Rivers guidebook, an iPhone and a sense of adventure the team were in high spirits! Rivers were decided on the M5, starting with the Wnion near Bala. In need of nourishment we obtained some redbull enroute. Refreshed and replenished by our liquid meal we dropped the bike off and headed to the get in. The Wnion was a long scrapy paddle into a gorge, filled with a couple of beautiful grade 4 drops (inspection necessary), linked by some delightful read and run technical grade four. We absolutely loved it. The inevitable game of rock-paper-scissors ended in Pete cycling the 6km to get the van. Finishing quite late in the day, a lunch on the move was called for; so another can of redbull was happy to step into the breach. Running low on light, we high tailed it to the Twrch to look at squeezing a run in. Better judgement prevailed and we decided to have a few goes at the bottom drop. This is a narrowing double drop, which although grade 5 in higher water, was running at a robust grade 4 level. After Dave demonstrated the perfect line on his head (Pete has kindly since referred to this as a 'victory roll'), the rest of the team decided to try and do it upright. Happily on the second run Dave decided that he could, in fact, paddle and did it properly. On completion Pete offered us a cold clammy night in the back of his van, and, although appealing, we settled on a cold clammy night in Bala bunkhouse instead. Deciding a diet of redbull was probably affecting our judgement, we settled down to an epic Chinese takeaway. Thanks Mr Chu. Waking early (6am) on day 2, vast quantities of bacon sandwiches were assembled before loading up and giving the bunkhouse a quick clean (more emphasis on quick, less on clean). More redbull was required before braving the icy wind and getting on the Lledr. 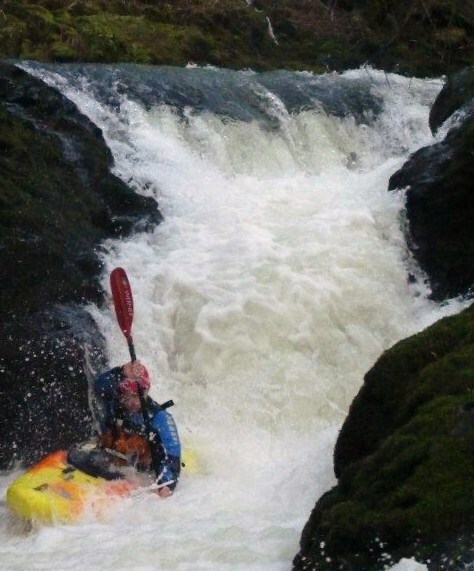 This a committing run, turning into more of a mini expedition than a sane paddle. Descending into two gorges, the first running at grade 5 and the second arguably unrunnable (certainly in the upper echelons of grade 5), called for a lengthy and tiring portage. The river-wide siphon into which the whole river disappeared was especially entertaining! Competent reading and running from the team made the boulder gardens on the decent a real joy, flaring from rock to rock, cushion to cushion. An absolute beauty. This was spoilt only a little by the troublesome portage and constant inspections. Nevertheless, a cracking grade 4 run was had by all. Hilarious moment of the day came from Dave landing in an eddy listing heavily to starboard sans paddles (they'd got got caught between 2 rocks). Supported only by Pete's arm and getting sucked downstream into the unknown Dave decided that he had no place in a boat without a paddle, and quickly exited. To his horror, however, the feature below turned out to be some rather calm grade 2 and he looked like a complete muppet. Phil then descended the easiest feature of the day backwards with a very confused look and, Dave was keen to note, not a single paddle stroke. In the search for Dave's paddles Phil decided that some "live baiting" was the order of the day; jumping into this pre-school torrent secured by a throw line. Unfortunately his nonchalant dry suit wearing drills backfired when he realised his relief zip wasn't properly secured; cue some cold and wet testicles. Dave, however, was completely dry. That's irony! The remainder of the run was lots of technical, rocky fun and passed without incident. Dave drew the short straw for the (steeper and frankly longer) cycle to get the van. A cracking weekend was had by all in some of the best boating Wales had to throw at us. Bring on the next trip!